As parents, it is natural and right for us to want to be sure that our child is prepared for the next stage of her learning, as well as life beyond school – where the skills developed in the classroom can be readily applied to real world issues. Where many parents get hung up, however, is confusing their own traditional educational history and path with what lies before their own children. The reason why you’re here at a Montessori school is because you wanted more. What we do in a Montessori environment is guide children to realizing the deeper meanings beneath abstract math and geometry concepts so that the knowledge is internalized. Then, when faced with larger more abstract challenges in math and geometry children can rely on their ability to think and problem solve to come to reasonable solutions – answers that require much more than just being able to calculate. 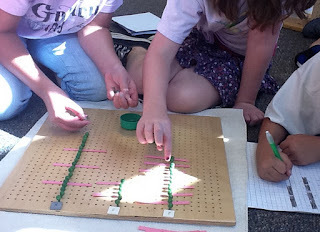 Math Text Books and Math Fact Sheets are natural extensions to the Montessori approach to mathematics education, but need to be used sparingly with great intention paid to when and why they are being used. Abstract, pencil and paper math works used for memorization and automaticity alone serve to undermine the entire philosophy of teaching in a Montessori environment; that is, learning to understand, to go deep, and to develop the skills of critical thinking. Hi Seth. Thanks for doing this. It's great and I've already shared it on my facebook wall. I appreciate your comments and agree wholeheartedly with what you've written. Hi Robyn! Thanks for having a look around. The school where I work is endeavoring to "return to center" regarding the Montessori math and geometry curriculum. It has been a challenging task, with multiple stakeholders weighing in on what's best for children. I am pleased that we have the instructional leadership present to protect and preserve the Montessori philosophy and approach to education. It appears to me that we, as a school, have at last begun to find our voice... remembering what's important, and how to practice what we believe.